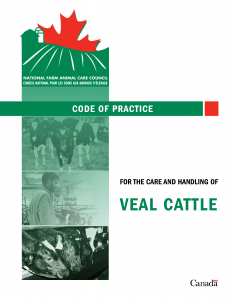 The Canadian Veal Association (CVA) and the National Farm Animal Care Council (NFACC) are pleased to announce the release of the new edition of the Code of Practice for the Care and Handling of Veal Cattle. Canada’s Codes of Practice are nationally developed guidelines for the care and handling of livestock. These basic documents ensure that animals are treated according to sound management and protection practices that promote their health and well-being. The codes serve as educational tools, reference documents in the regulations and as the basis for the industry’s animal care assessment programs. Consult the Code by clicking here. Production of quality meat requires sound herd management practices that assure the welfare and proper development of the animals we raise. For cattle producers, raising a herd is more than just a means of providing a living – it is also a passion. For each animal to produce quality meat, the producers raise their animals under conditions that satisfy more than their basic needs. They ensure that each animal develops in a calm environment that will allow it to engage in its natural behaviour. Over the past few years, several codes have been published to inform producers about practices that respect animal welfare. 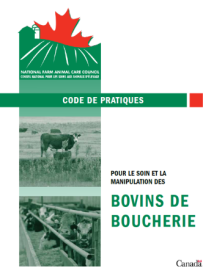 Although these codes do not contain compulsory standards, Quebec cattle producers adhere to recognized animal welfare principles and apply these practices to ensure their livestock’s health. 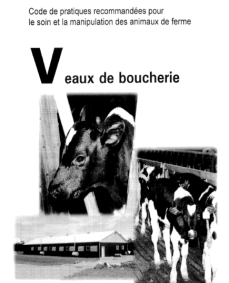 Participation in the drafting of the Codes of Practice by providing expertise on veal and beef production. 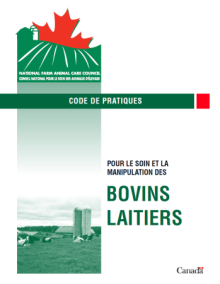 The Codes of Practice are guidelines developed at the national level for the care and handling of livestock. These codes are the Canadian interpretation of the needs and best practices recommended in animal care. For more information on the codes of best practices, visit the website of the National Farm Animal Care Council. The Quebec Animal Welfare and Safety Act. In December 2015, the Quebec Government adopted the Animal Welfare and Safety Act. The Ministère de l’agriculture, des Pêcheries et de l’Alimentation (MAPAQ) is responsible for enforcing the Act. It intervenes when animal health or welfare is threatened. Inspections are conducted on Quebec farms. To learn more about the MAPAQ’s role and the Act, click here.